I wonder if the horse and hearse are actually O scale figures and if they are detachable. I wish they would show different angles. The second Halloween one is a 2-6-0 but it looks like it is devoid of any detail. I've seen the Marine one before. The Budweiser one has a beer wagon on a flat car. The Budweiser ad says 2-6-0 but the picture is showing a 4-6-0. I've been going through their stuff. They have a lot more things than they did the last time I checked their site years ago. Their "On30 Scale HO-Gauge Track Accessory Set" says it includes six - 9" radius curves. I emailed them and let them know it was wrong, as well as about the pics of 4-6-0's with the ads saying 2-6-0's. I like this bridge from them. I should quit looking before I end up buying something. That bridge is amazing! I have absolutely ZERO place to put it, and I was still considering if I wanted it when I get paid! I also like their fancy display cases. I emailed and asked how long it is. I think it's too long for my elongated figure 8. Maybe I could make a high oval over the figure 8 this year for Christmas. I'd really like to see a back view of it to see if it is just flat. It would be nice if they did a mirror image one then you could have a tunnel between them. You may have to do some cutting downwards this year if you want that bridge Terry. Unless you plan on having a helix up and down. You wouldn't really need a mirror image one... just reverse it... maybe do a bit of sanding on each end to make it flush. It definitely wouldn't fit in my figure 8 so that was just wishful thinking out loud. 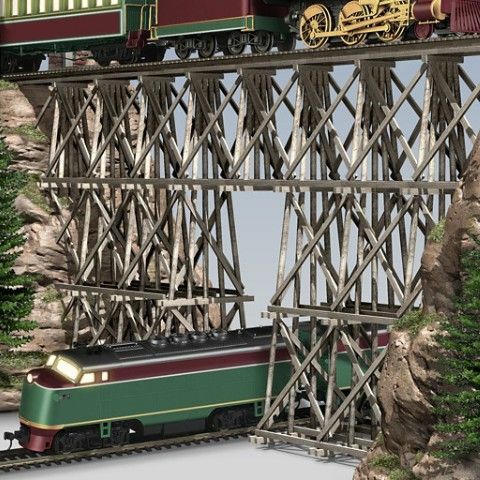 The trestle looks like it is flat on the back side and the end with the tunnel entrance like it should be in a corner. It's too hard to tell from the pic. If you turned one around, I fear you have just flatness. "I am very sorry, I do not have the product information you requested. All of our products are backed by our generous return policy, if you are not fully satisfied." Maybe whack the portal off one end and put it on the other end would do it. It's just a gamble (and money) without knowing what the back side looks like. Yeah... I would be hesitant to buy from a company that has no idea what they are selling. It would be better to find it on eBay. I figure I'll look around on EBay. The trestles are new so it might be a while. The stuff is obviously geared to the Christmas crowd and the Dept. 56 scenery folks who want something railroady to display, not to model railroaders. Terry: Suppose you incorporated the trestle into your layout as a mining scene? I can picture a Porter coming out of a 'mountain' pushing some V-dump cars on the elevated part. That's a great idea. I still wish I knew how long it was. What is the normal distance between bents on a trestle? There are 10 under the track. The passenger car is close to 9". A Mogul and standard tender is about 11". The tender is 5" if it is a standard size Bachmann Mogul tender. In some pics the Bradford tender looks shorter but maybe it is the angle. It looks like you could fit a tender in the space in front of the loco in the pic. I'm guessing the trestle is close to 9" + 11" + 5" or about 25". That would come out close if there is about 2 1/2" between bents. Likely the trestle would measure out to be 27 inch's, or the length of 3 section's of 9 inch track. to gain the height necessary to use on a flat top table. Ken: The trestle is listed under Train Accessories. Sadly, very little is said about it besides the sales pitch. Ken - Originally I was thinking 27" and that is probably right. There might be 7" in front of the loco. It's hard to tell. I was wrong on the bents. There are only 9. The price is pretty steep at $129 without having a specific purpose for it. I'm still thinking about it. In perusing their pages, I found some other things that caught my eye. They have a couple of Christmas trees with multi-levels of trains going around that my great grandkids would probably enjoy seeing and one with Disney characters going around. Average tie length for HO is 1.17", call it 1.25" for a round number. The opening for the track under the trestle is three bents wide, with the center bent cut off to make the opening. Looking at the track under the trestle it looks like roughly 0.25" between the tie ends and the trestle bent on either side. Which would create an opening about 1.75" wide. Dividing that in half would give a spacing of 0.875" (7/8") between trestle bents. With 9 bents, it creates 8 spaces under the trestle, not counting the space between the end bents and rock walls. And 8 * 0.875" gives an overall length of 7" between the end bents. I'd say someone is taking some serious artistic license with the size of the locos and rolling stock shown in those pictures.